Apakah anda saat ini sedang mencari tempat yang Jual Alat USG Portable, Mesin USG (DIgital Ultrasonografi, Ultrasonography), Ultrasound Scanner? Kami menyediakan Alat USG Portable murah dengan kwalitas terjamin (harga USG Portable murah kwalitas terjamn bagus). Alat USG/Mesin USG kami bisa digunakan untuk berbagai keperluan karena dilengkapi dengan berbagai plihan Probe seperti seperti probe untuk pemeriksaan kehamilan (USG Kandungan) untuk OBGYN, pemeriksaan abdomen, probe untuk vaskular, probe untuk transvaginal, dan probe untuk pediatric dan cardiac. 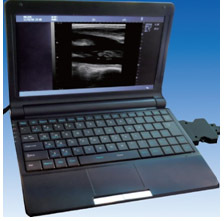 BELSON 3000M, a full digital notebook ultrasound/ultrasonic scanner with extremely slimming appearance, is easy to carry (1.5 kg with a probe) and has powerful functions for multiple diagnosis purposes. High cost performance solution for family doctor, Individual clinics, medical team, emergency center and hospital doctor. Software packages applicable to obstetrics, gynecology, urology, cardiology, superficial organs and abdominal diagnosis. Full size/Weight(whole set):37 X 27 X 6(cm)/5.5KGs Approx. User-friendly keyboard and touchpad operation. Multiple output ports including 1 SD card slot, 1 mini-USB and 2 USB2.0 ports. SD card supported. Massive USB storage media supported. Direct print via specified printer models. Firmly special bag protects the unit from unexpected bump..